A Johns Hopkins biologist has been selected by the Partnership for Undergraduate Life Sciences (PULSE) as one its new Vision and Change Leadership Fellows, a group charged with spending a year identifying and recommending ways to improve undergraduate life sciences education. 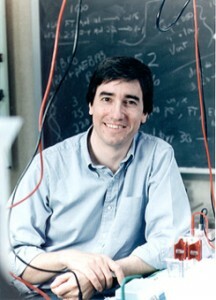 Joel Schildbach, a biology professor and director of undergraduate studies at Johns Hopkins’ Krieger School of Arts and Sciences, is one of 40 faculty members selected from 250 applicants from 24 states and the U.S. Virgin Islands by PULSE, a joint initiative of the National Science Foundation, the Howard Hughes Medical Institute and the National Institutes of Health. “It’s an honor to be selected and in the company of some of the real leaders of this nationwide effort to enhance undergraduate biology education. I am especially pleased by what I see as an endorsement by PULSE of our ongoing efforts to improve how we educate Hopkins undergraduates,” said Schildbach. Schildbach is on the faculty steering committee for The Gateway Sciences Initiative, a yearlong university wide effort to promote wider adoption of successful teaching techniques already in use and to encourage the development of innovative new approaches to learning at Johns Hopkins. In addition, he is director of the BioREU summer undergraduate research program, a National Science Foundation-funded 10-week summer program designed to provide an intensive, mentored research experience for undergraduates, especially those attending institutions with limited research opportunities. Judith Verbeke of the NSF said the fellows represent “a diverse group of extremely capable faculty” chosen for their experience in catalyzing reform in undergraduate biology education. The fellows hail from research universities, liberal arts colleges, comprehensive/regional universities and two-year colleges. A list of the Vision and Change Leadership Fellows is available at www.pulsecommunity.org.